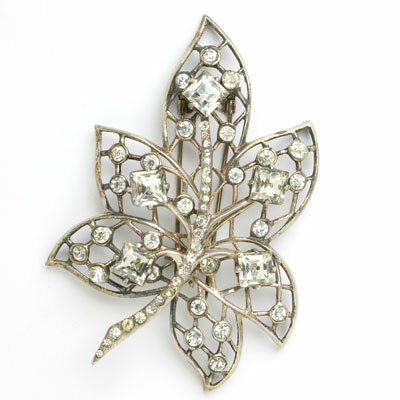 This stunning selection of Eisenberg jewelry from the 1940s features brooches, earrings, bracelets, and fur clips in the beautiful designs and high-quality materials that make this company’s pieces so desirable. 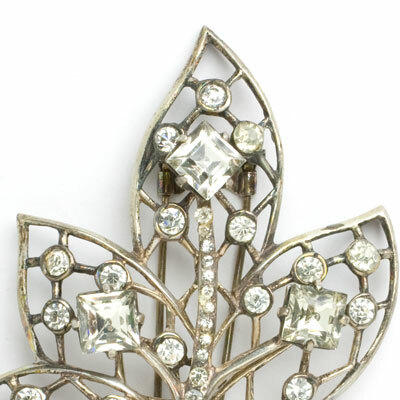 From its beginnings as a manufacturer of women’s dresses in Chicago in 1920, Eisenberg & Sons launched a separate jewelry line – Eisenberg Jewelry Inc. – in 1936. Their jewelry was produced by Fallon & Kappel (F&K) as well as others until 1943, when F&K became their exclusive supplier. Ruth Kemke became their exclusive designer, producing intricate bows, florals, and abstract designs executed in hand-set, highly-leaded crystals with exceptional sparkle. Read more about Eisenberg. 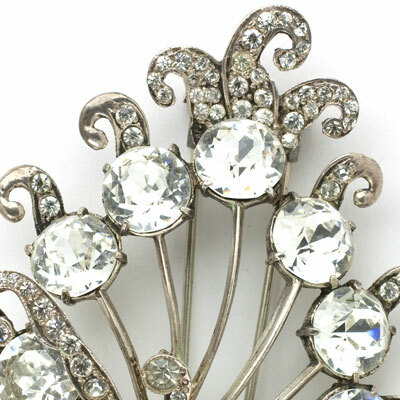 Prong-set, large diamanté flowers are complemented with pavé ribbons in this substantial, yet graceful sterling silver 1940s dress clip. Although it is unsigned, the high-quality design and construction as well as the style of the piece makes me believe that it came from Eisenberg. It has a hinged, double-prong fastener, which works well with weighty fabrics. 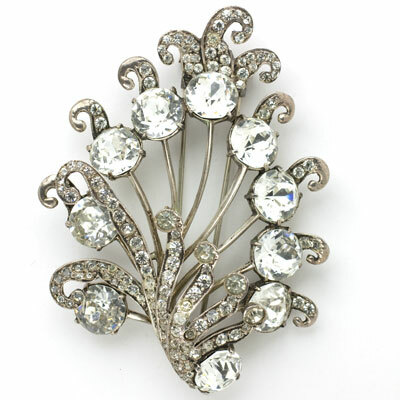 This piece would really stand out on the lapel or shoulder of a jacket or coat. What a glorious statement! 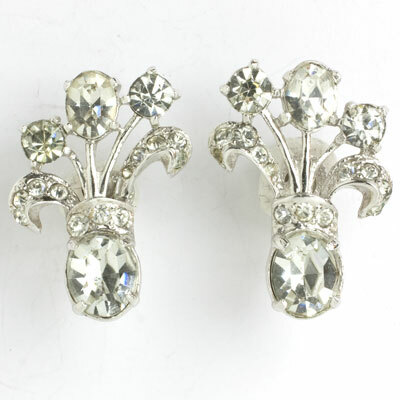 These late-1940s earrings by Eisenberg look like flowers in a vase. They have faceted oval and round diamanté set in rhodium-plated sterling silver with screw-backs. These earrings faces each other, so they will frame your face to perfection. This pair features all of the beauty and high-quality of this maker's creations. In fact, these earrings were chosen to walk the runway at Toronto Fashion Week for Spring 2019. The model wore them with a pair of bracelets made in Germany in the 1930s – scroll down to see them. Surprised at the combination? It rocked! 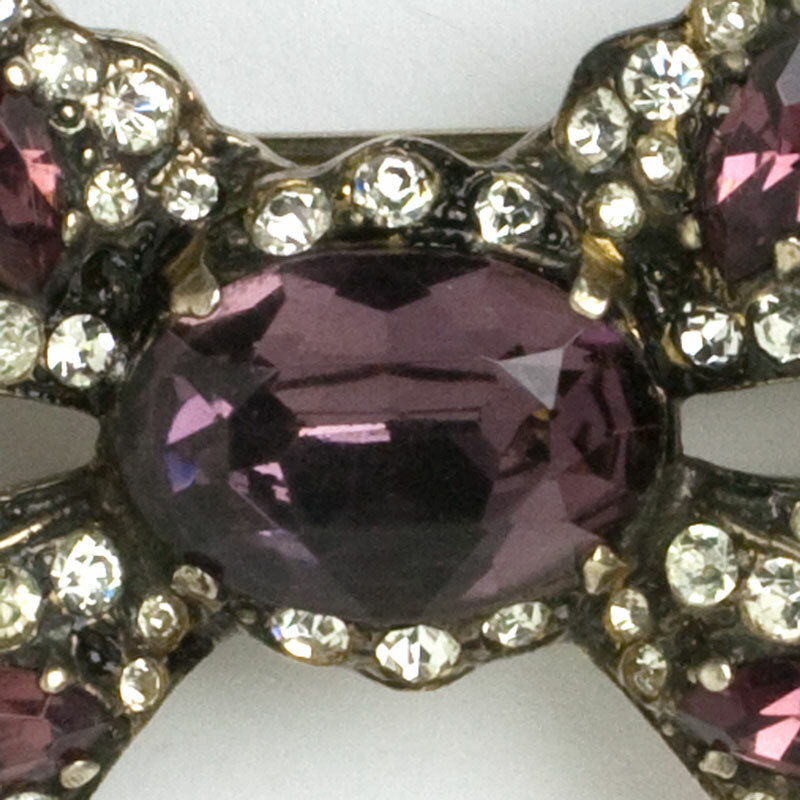 This Eisenberg dress clip from the late-1940s is substantial in weight and size. It has two layers: square-cut diamanté flowers with a pavé stem that sit atop a sterling silver leaf embellished with additional diamanté. The cut-outs on the leaf add a graceful effect. The hinged, double-prong fastener works well with weighty fabrics. 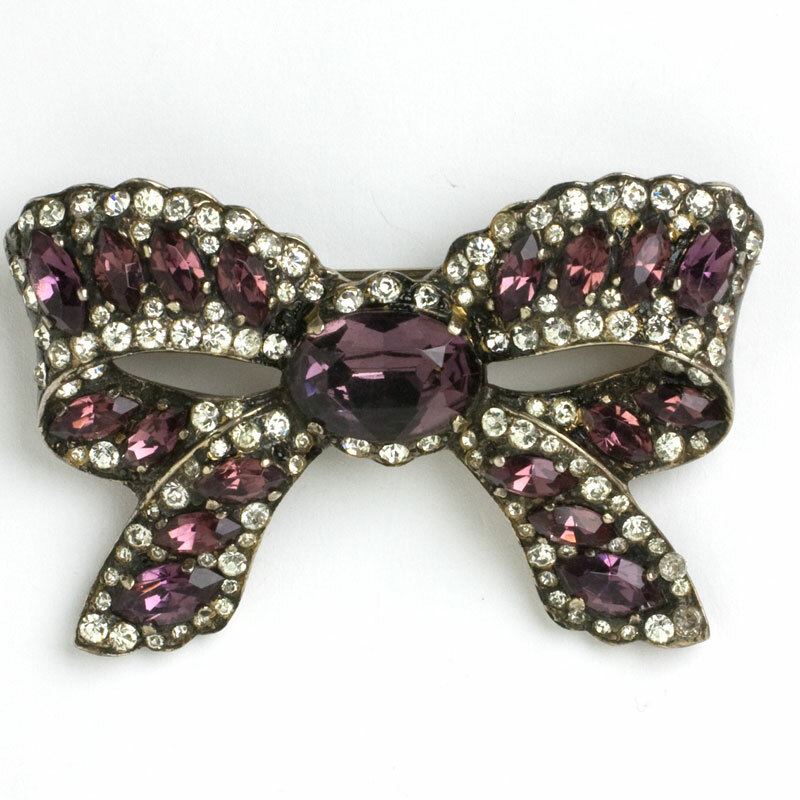 You could wear this jewel on the shoulder or lapel of a dress, jacket or coat, and own any room you enter! What a knockout! These Eisenberg earrings have small round diamanté emanating from a larger stone, forming a sunburst design. The setting is sterling silver with screw-backs. These earrings are really alive with sparkle! They were advertised in the September 1, 1947 issue of Vogue. And they haven't lost their appeal – this pair sparkled on the runway at Toronto Fashion Week for Spring 2019. 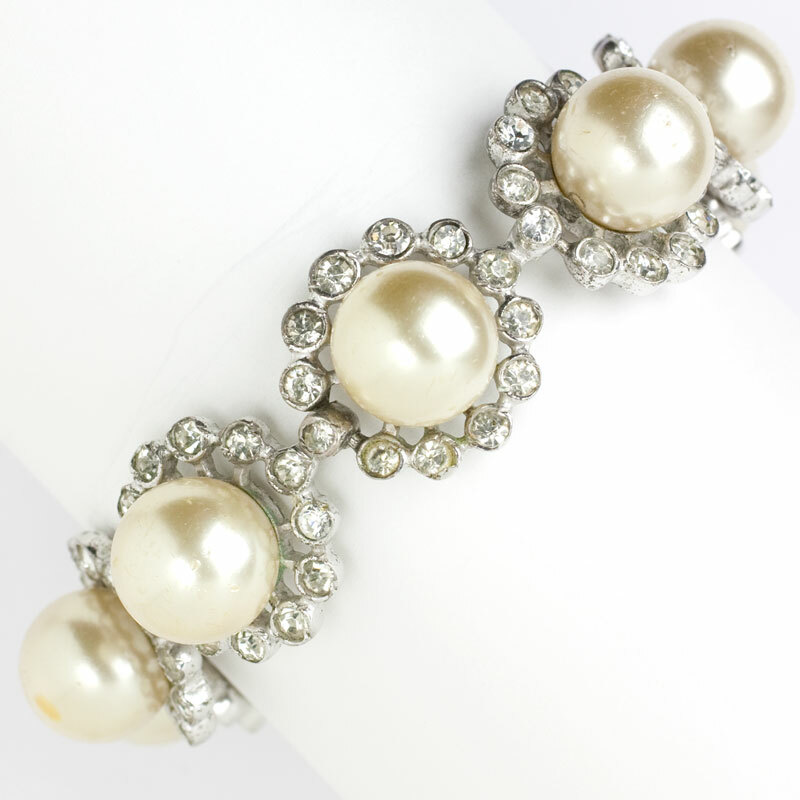 Scroll down to see a pearl and diamanté bracelet by the same maker, in a similar design. 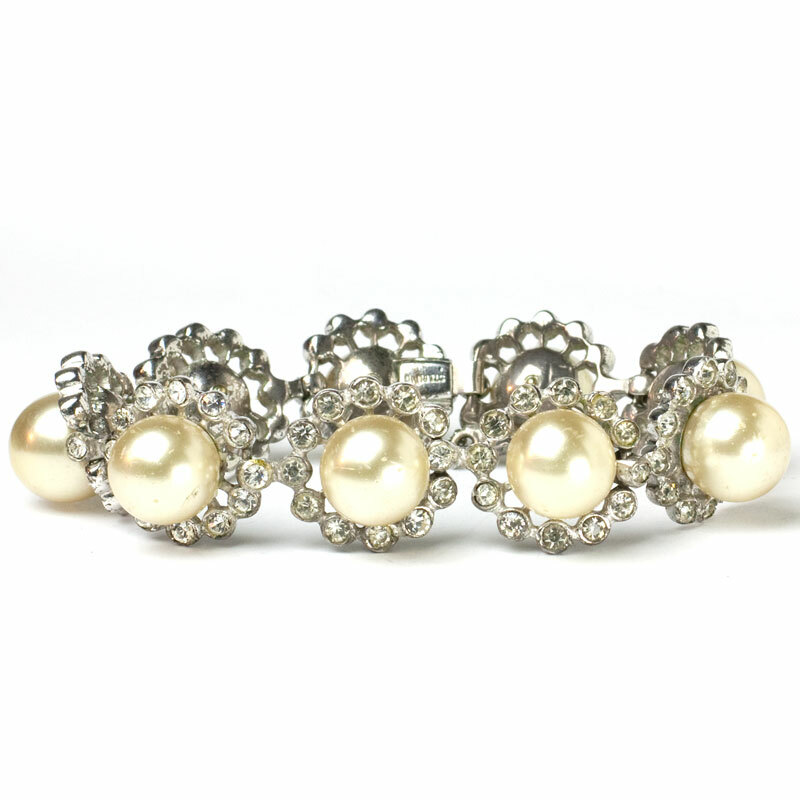 This vintage pearl bracelet is substantial, well-made, and stunning. Each link has a large glass pearl sitting atop a ring of diamanté set in sterling silver. The design is similar to the maker’s Cornucopia brooch and earrings but on a larger scale. This late-1940s jewel, which closes with a concealed clasp and safety chain, is another statement piece. You can wear it with the Diamanté & Sterling Sunburst Earrings, also by Eisenberg, which are similar in design – scroll down to see them.